The shown HMV portable gramophone model 101 is a so called colonial model, because in this finish it was only available in british-india. 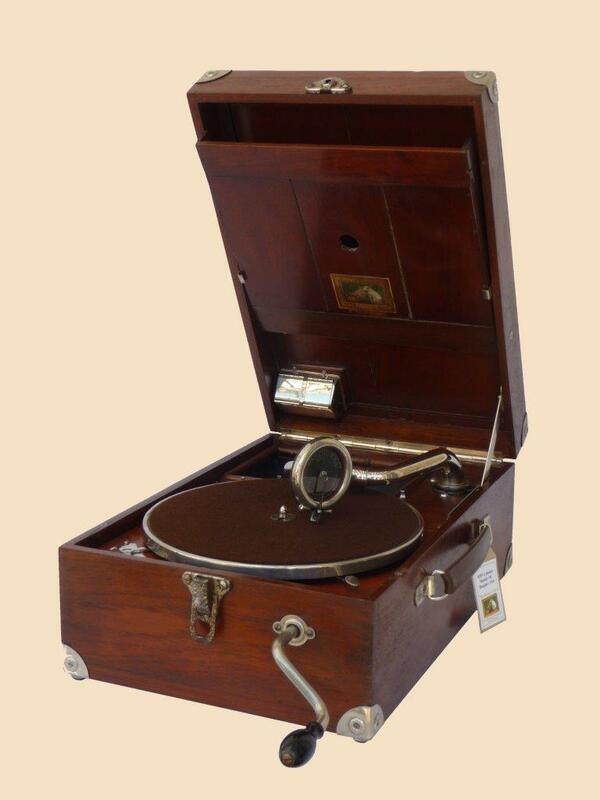 It has a solid teak case and was made by the Gramophone Company of India. 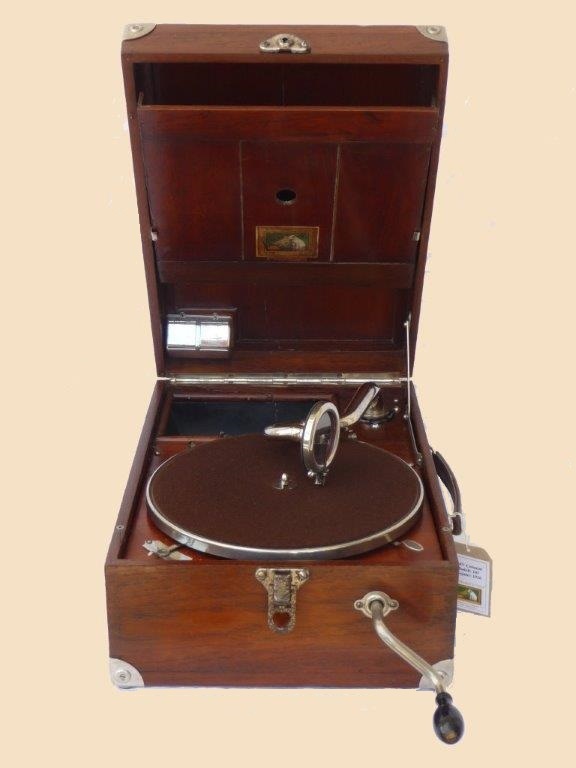 The model shown below is a kind of a special version of the portable model 101 for the Indian and colonial market. The case and all the parts that were Rexine-covered in the conventional model, are made here in solid teak. 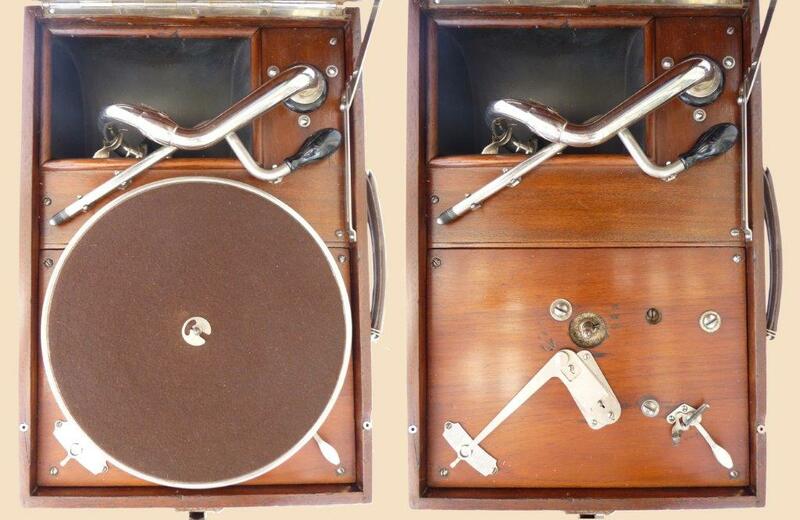 From the parts and front-wind-motor used on this model it corresponds to european model 101, as it was made in 1925. As with the "standard" 101 there are different types of the indian model 101. Bei dem hier gezeigten Gerät handelt es sich um eine Art Sonderausführung des Koffermodells 101 für den indischen bzw. Kolonialmarkt. Der Koffer und alle Teile die beim konventionellen Modell mit Leder/Kunstleder bezogen waren, sind hier aus massivem Teakholz gemacht. Von der Ausstattung und dem Frontaufzug entspricht es einem Modell 101, wie es um 1925 hergestellt wurde. Wie auch beim europäischen "Standard"-101 findet man auch das in Indien gefertigte 101 in den unterschiedlichsten Ausstattungsvarianten. The first version of the Model 101 doesn´t has any autobreak. The winding handle clips on the front wind-101s were not well postioned and it´s unusual to find all three complete. 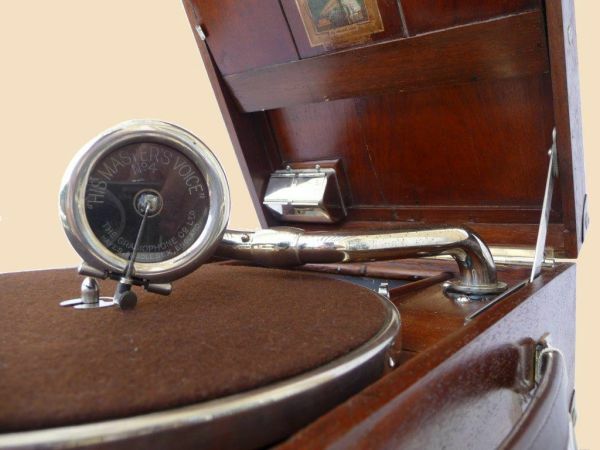 The machine is fitted with the first version of the HMV No. 4 soundbox (with the lettering behind the mica). Furthermore it has the needle container on the left side of the lid. It is the same like the model 100 has, but on the 100 it is located on the right side. The winding handle on the front-wind-101s was not well positioned. To wind up the motor, the machine always had to stand on a table edge. This was changed with the introduction of the side-winding motor.